It is a nice design but the fur sheds all over. The worst part is that it is not cleanable!....no dry cleaning or no washing....not sure what to do with it as I can not use it again until it gets looking better!!!!!!! Very disappointed. Return policies are poor also. I'm sorry that you feel that way, we would suggest contacting our Customer Service Department to discuss this issue further. They can be reached by phone, through e-mail, or via our online chat feature listed on the website. We look forward to hearing from you soon! Have to say the outfit is gorgeous online but the fur was all over the outfit and looked like a cat had been on it - it got all over me and was just not worth the price to me. They need to redesign with a different fur. Thanks! Do not buy this costume. Sheds everywhere.You have to pay to return the costume ,then the company takes 20% from your balance. Do not buy. I'm sorry for any confusion, if you could contact our Customer Service Department regarding this we'll make sure to fix the problem for you right away! We look forward to hearing from you soon. it was beautiful, just too small.. Maybe next year! Thank you so much for sending this out so quickly. 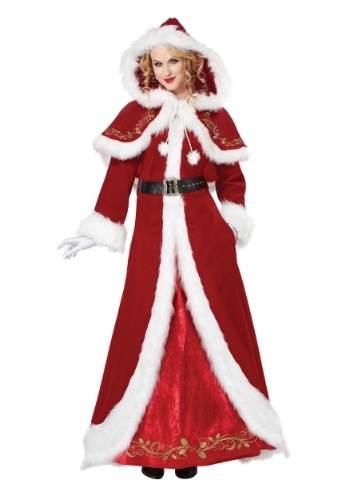 I had the same from another Costume Website, but they had it on back order and it might not even be in by December. It really is nice and comfortable. I did cut the hood off the cape but the cape is perfect without it.